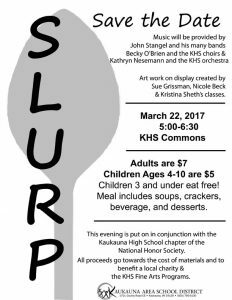 KAUKAUNA — Kaukauna High School’s annual fundraiser, SLURP is scheduled for 5 p.m. to 6:30 p.m., Wednesday, March 22, 2017 in the Kaukauna High School commons. SLURP, in its fifth year, was created as a unique fundraiser to promote awareness and raise money for fine arts programs at the school and throughout our community, according to a school district news release. The fundraiser attracts community members by offering a number of different kinds of soup, provided in sample-sized cups, for attendees to purchase and … slurp! Kaukauna High School art program students will also donate a number of items that will be available for purchase and live music will be provided by KHS choirs, orchestra and bands throughout the evening. Tickets for this event are $7 for adults and $5 for children aged 4 through 10; Children 3 years old or younger can “slurp” for free. The admission price earns attendees the right to sample from the aisles of soups donated by local businesses, school clubs, students and staff members. Crackers, beverages and desserts will be provided as well. This year, all proceeds from the event will be split between the KHS fine arts programs, blood drives, NHS Induction Ceremony, and a local charity.